R. Ryan Endris has received critical acclaim for his "ability to imbue his vocal and instrumental forces with his view of the music" and for his ensembles' "clarity, exquisite phrasing, and vibrancy." 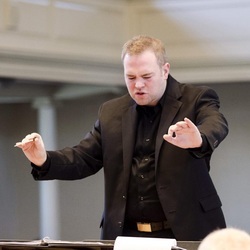 Highly sought after as a conductor of both choral and instrumental music, he currently serves as Assistant Professor of Music and Director of Choral & Vocal Activities at Colgate University, where he conducts the Colgate University Chorus and Chamber Singers. He has published two books with Steerforth Press (The History of Classical Music For Beginners and Music Theory For Beginners), and his article "American Transcendentalist Philosophy and Symbolism in the Text and Music of Dominick Argento’s Walden Pond" appears in The Choral Scholar. As an Associate Instructor at Indiana University, he served as chorusmaster for IU Opera and Ballet Theatre’s production of Cosi fan tutte, as well as assistant conductor and chorusmaster for the company’s production ofThe Nutcracker. For 6 years, Dr. Endris served as Director of Music at First Christian Church in Bloomington, IN, where he conducted the church’s four choral ensembles and orchestra. Dr. Endris is also in demand as an arranger of choral and instrumental music throughout the country, and his arrangements have been heard by audiences around the world. He has been commissioned for arrangements by both educational and professional organizations, including The Indiana University Singing Hoosiers, The Indiana University Wind Ensemble, The Bay View Music Festival (MI), Bloomington POPS Orchestra (IN), and LaGuardia High School for the Performing Arts (NY). He has taught music education, music theory, choral methods, and conducting courses at St. Mary-of-the-Woods College in Terre Haute, Indiana, where he served as Visiting Assistant Professor of Music and Director of Choirs. Other recent appointments include Conductor of the Indiana University All-Campus Chorus, chorusmaster for the Bloomington POPS Orchestra, Interim Artistic Director and Conductor of the Indianapolis Men’s Chorus, and Music Director of IU Sing. Dr. Endris holds Doctor of Music and Master of Music of Choral Conducting degrees from the Indiana University Jacobs School of Music, as well as a Bachelor of Music Education (K-12 Choral/General Music). He has studied voice with internationally acclaimed soprano Sylvia McNair, and his conducting teachers and mentors include Robert Porco of the Cleveland Orchestra; John Poole of the BBC Singers; Dale Warland of the Dale Warland Singers; and Vance George, Director Emeritus of the San Francisco Symphony Chorus.